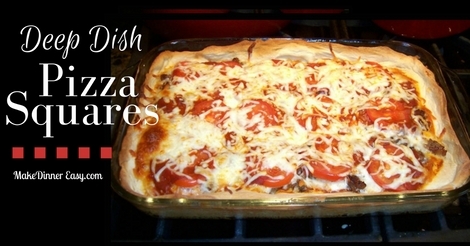 I've been experimenting with various recipes for deep dish pizza for awhile. Having four kids, my crew would be happy if I made pizza every week, and I thought it would be a recipe of interest for this site as well. I came up with a version that uses frozen bread dough for a crust and you can use your hands to press it into place; no rolling pin required! 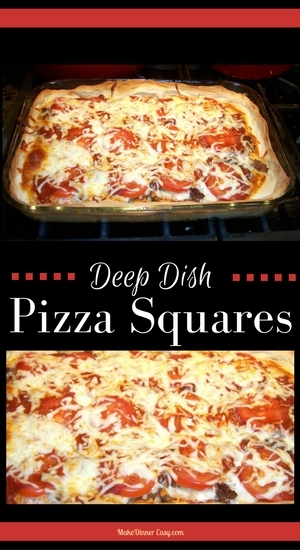 I've also used a common sized baking pan for this recipe since not everyone has a deep dish pizza pan. Although this recipe calls for a filling of Italian Sausage and fresh tomatoes, you can certainly use your choice of filling ingredients. In the morning, pour 1 teaspoon of olive oil in a large mixing bowl and spread around and up the sides of the bowl using your fingers. Place the frozen bread dough in the greased bowl and cover with plastic wrap. Allow the dough to defrost and rise for at least 6-8 hours. About 60 minutes before dinner, preheat the oven to 400°F. Brown the Italian sausage in a large skillet, breaking it up into small clumps using 2 spoons. When fully cooked and browned, add the diced onions to the pan and sauté and additional 1-2 minutes until onions are softened. Remove from heat and blot off any excess fat. Place 1 teaspoon of olive oil in a 9”x12”x2” glass baking pan. Place dough in the center and turn it over once so that all sides are covered with olive oil. Using your hands press out the dough so the dough covers the bottom and up the sides of the pan evenly. If the dough wants to spring back, try holding the dough in place for a few seconds until it stays in place. Bake the crust at 400°F for 5 minutes. Remove the crust from the oven and spread pizza sauce evenly over the bottom of the crust. Sprinkle the oregano on top. Sprinkle 1 cup of mozzarella cheese on top. Then spread the cooked sausage and onion mixture over the cheese. Sprinkle another cup of mozzarella over the sausage. Place the sliced tomatoes over the mozzarella and cover with the remaining cup of mozzarella. Bake at 400°F for 25 minutes. Allow to rest for 5 minutes before cutting into 2-3” square.Serves: 6-8 and leftovers are great for lunch.